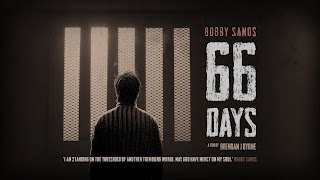 Bobby Sands: 66 Days is a 105 minute documentary film that weaves together the story of 1970s and 1980s republicanism with day by day updates on Sands’ condition and diary entries throughout his hunger strike. The documentary film is bookended by quotes from Fintan O’Toole. In one he describes the 1981 hunger strike as “drama at the absolute rawest edge it could possibly be”. In the other, the author and commentator says that, like 1916, 1981 was also “undoubtedly a turning point” in Irish history. It’s a peculiar melange of styles and devices. Far too much explanatory text appears on screen. We see a replica cell being built out of wood which is used to stage images from the cell to illustrate changes in Sands’ environment. Some animation is employed. And with very little footage of Bobby Sands and the other hunger strikers, his presence is mostly conveyed through his poetry and other writings alongside rich imagery, photographs and archive news footage of events outside prison. Amidst this hotchpotch of storytelling, the director Brendan J Byrne and editor Paul Devlin create some interesting cinematography – running footage of car bombs and shootings in reverse, and slow motion republicans bands drumming – creating space for audiences to pause and think about events. The international dimension and reporting of the story is highlighted with an ABC News ‘Special Report’ announcing Sands’ death. A sense of morality is (not so subtly) introduced through a reading from the Bible. There’s a lot of hyperbole in the statements made by the (predominantly male) experts interviewed for the film. It’s clear that the republican family was happy to cooperate with its making, with contributions from Danny Morrison and Séanna Walsh. Gerry Adams is interviewed wearing a Féile an Phobail t-shirt. Thomas Hennessey adds a welcome academic and historical perspective to the political and cultural commentary: he’s one of the few talking heads that brings any energy to his observations in this overly long film. At one point the voice of Ian Paisley booms out of the screen. While the general lack of overtly unionist voices – Norman Tebbit is an exception – doesn’t lead to any overt romanticisation of Bobby Sands, it does make the narrative a bit boring (if ‘boring’ is ever an apt word to describe a film about people starving themselves to death). It’s difficult not to compare and contrast 66 Days with Steve McQueen’s 2008 film Hunger which achieved a much better balance with its examination of the work and lives of prison officers alongside the central narrative of the republican inmates and the conditions they lived in. Where 66 Days does a better job than Hunger is in conveying – though perhaps, overplaying? – the untypical background of Sands: the boy from Rathcoole who played in a cross-community football team. At times 66 Days seems contradictory. Early on one voice tells the audience that there’s a long history of hunger strikes; later we hear that “hunger strikes are peculiarly modern”. The film doesn’t make Sands out to be a hero; but it is clear that many of the contributors do view him in that light. The pain in the voices of Sands’ election agent and fellow prisoners who survived is still evident as they recall saying goodbye. Much is made of an old quote from 1920 hunger striker Terence MacSwiney that “it is not those who can inflict the most, but those that can suffer the most who will [win],” suffering publicly and over a long time. One challenge of the film is for mainstream republicans to preach this message to their dissident peers. “You win when you capture the public imagination” and endure rather than inflict suffering. The film finishes with the jump from Bobby Sands’ death to the emergence of the peace process (and significant US involvement). Just before the closing credits, a caption appears marking Bobby Sands’ birth and death and noting that in total 3532 lives were lost in the conflict between July 1969 and December 2001. Bobby Sands: 66 Days is neither an apologetic nor a rose-tinted documentary. The film sets events firmly in context but the critique of the hunger strike, the decisions of the UK government and the protest’s long term effect is fairly lenient. Polling day for this year’s NI Assembly election coincided with the 35th anniversary of Bobby Sands’ death. If anything, Sinn Féin played down references to the hunger striker during the election campaign and didn’t seek to make too much obvious political capital from the anniversary. If the ambition was to commission a documentary to examine the legend of this republican hero, the dissatisfactory result is a well crafted but very curious blend of comment, re-enactment and voicing of Sands’ words that bounces between facts, analysis and the deteriorating health of the prisoner. Unionist politicians complaining about the film should save their breath until they’ve seen the completed work and then decide whether they even want to draw attention to the work. The film is a co-commission for BBC Four Storyville and BBC Northern Ireland made by Fine Point Films and Cyprus Avenue Films (in association with Northern Ireland Screen, Sveriges Television and the Danish Broadcast Corporation with the participation of The Irish Film Board). Bobby Sands: 66 Days will be screened in the Kennedy Centre Omniplex on Wednesday 3 and Thursday 4 August (tickets £8) as part of Féile an Phobail and will go on general release from 5 August. Update - Denzil McDaniel reviewed the film for the Impartial Reporter. 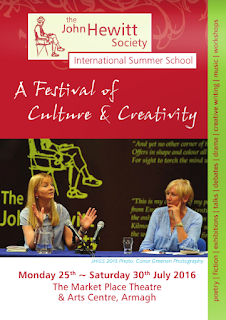 The annual John Hewitt International Summer School runs next week in Armagh. 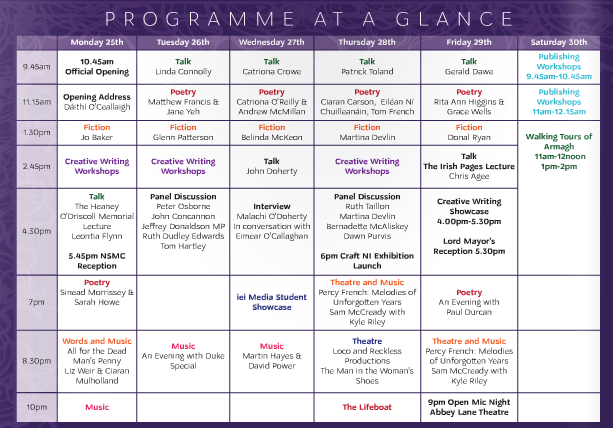 While it’s possible to book a place and take in the full programme, individual events are also ticketed. Everything takes place in The Market Place Theatre and Arts Centre, Market Street, Armagh, BT61 7BW. Monday 25 July at 11:15am - Diplomat in Moscow, Belfast, New York, Finland and Estonia, ambassador to London and the UN, Dáithí O’Ceallaigh will deliver the summer school’s opening address. Retiring from the Foreign Service in 2009, he is currently director general of the Institute of International & European Affairs in Dublin. Monday 25 July at 4.30pm - Creativity in the Digital Revolution is the title of poet Dr Leontia Flynn’s Heaney O’Driscoll Memorial Lecture. 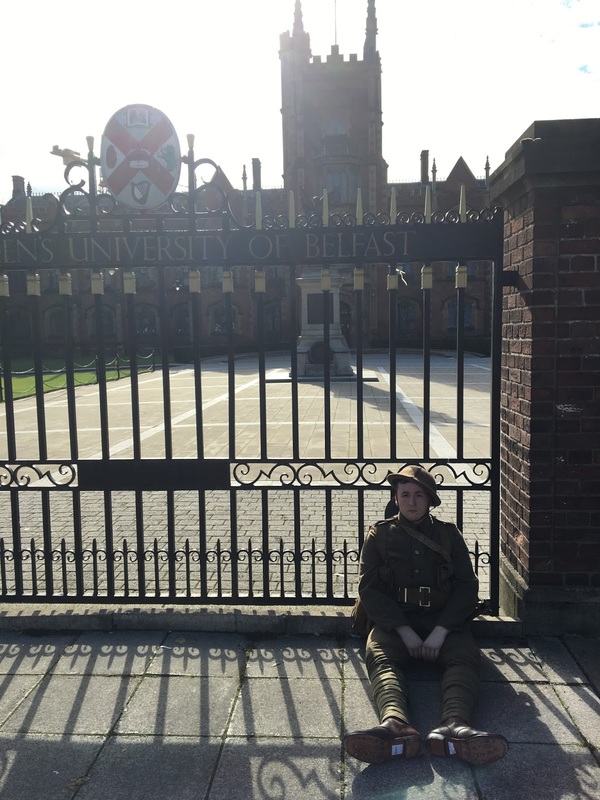 Tuesday 26 July at 9.45am - In her talk 1916 & Women: Unfinished Business Dr Linda Connolly will argue that women’s roles and rights in Irish society deserve much fuller attention, both in relation to the history of the 1916 Rising and its historical legacy. Tuesday 26 July at 1.30pm - Author, broadcaster and screenwriter Glenn Patterson will read from his latest published novel Gull. Ruth Dudley Edwards (biographer of James Connolly and Patrick Pearse, commentator on Irish affairs). Tuesday 26 July at 8.30pm - An evening of music with Duke Special. 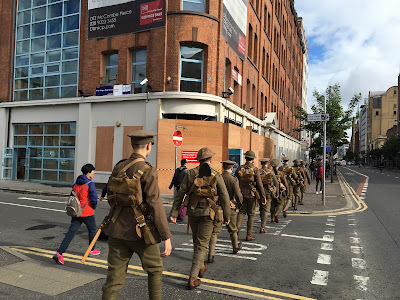 Wednesday 27 July at 9.45am - Catriona Crowe asks How Have We Remembered 1916? She’s head of special projects at the National Archive of Ireland and manager of the Irish Census Online Project. Wednesday 27 July at 4.30pm - Malachi O’Doherty will be in conversation with author Eimear O’Callaghan sharing his thoughts on Sinn Féin president Gerry Adams. Malachi’s biography of the politician will be published by Faber. Susan McKay (journalist and author). Friday 29 July at 4.30pm - Poet Chris Agee is editor of Irish Pages and will deliver the publication’s 7th annual lecture. In Troubled Belfast Chris will distil 37 years as an immigrant in Belfast, focussing on the aftermath of the Good Friday Agreement and drawing on pan-European parallels. He’ll reflect on the dynamics that continue to “trouble” Belfast and speculate that becoming multicultural may be the most momentous of all the changes in Belfast following the Troubles. Six men gather on a doctor’s large luxury motor boat. For some it seems to be a regular getaway; for others it’s the first time they’ve come along to the macho retreat. It’s quickly apparent – if anything in the ponderous 105 minute film Chevalier is truly ‘quick’ – that there’s a competitive streak running through the boat. And the competition escalates whenever they decide to formalise their rivalry into a “The Best in General” contest. The winner is supposed to wear a Chevalier signet ring until they get back together to play again. Soon every gesture, posture and activity is being judged and scored. It’s like a very mundane version of Jackass. Less physically painful to watch, but even more emotionally gut-wrenching as the performance anxiety, sibling rivalry, bullying, opportunities for humiliation and fatuous testosterone-driven tournament progresses. Fans of Swedish homebuilt furniture will be particularly impressed with one round: the only challenge I’d have won! Frankly it’s baffling that these six guys would ever want to share time away together. Of the six, Dimitris (played by Makis Papadimitriou) is vulnerable and naïve and the object of pity; he has tagged along with his brother. He’s the most honest of the game players, yet he’s still not likeable. The opening shots set the dark tone, bringing out the black of the rocky coastline. The first few minutes with its tight foreground focus on the men and very blurry distance made by eyes hurt, but the visual effect was soon dropped. Music is used so infrequently that the three or four times it is dropped into the soundtrack of waves and wind it’s like a fresh character walking onto the screen. The on-screen angst transfers into the chests of the audience who are bound up in this dreadful derby. The air of judgement also transfers to the yacht’s crew. Playing Top Trumps with blood test results deservedly elicits a giggle or two. There are laughs at irregular intervals, but the film stops well short of being any kind of comedy, never mind a black comedy. The all-male movie keeps women behind the camera. Is the director Athina Rachel Tsangari perhaps judging even more harshly than the men, with a similar notebook full of scribbles and marks? And do men really play these games? Really? Surely it’s a phallic fallacy? There have got to be better ways to live and rest and enjoy company than this. The insecurities and poor judgement feels universal rather than Greek, and the film could have been set in any shoreline around Europe (or further afield) as easily as around the coast from Athens. The end is apt and some came out of the screening I attended raving about the film. Others – like me – found it to be a pointless object lesson on how to be a complete idiot, with five or six prime examples to work from. 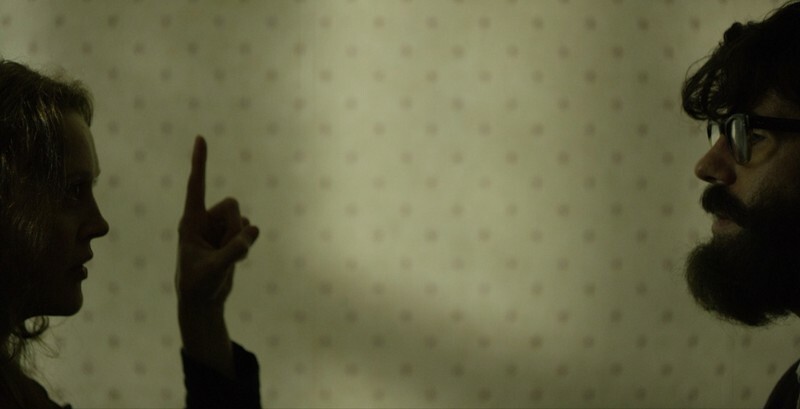 Either way Chevalier is a painful, yet effective, character study. Chevalier is in the Queen’s Film Theatre from Friday 22 to Thursday 28 July. Yesterday morning in Belfast a group of men dressed in WW1 uniforms quietly marched down the Stranmillis Road and stopped outside Queen’s University, leaning against bollards, lying back on the wrought iron gate. After a while one soldier struck up the song “We’re here because we’re here” – sung in the trenches – and the other voices joined in. 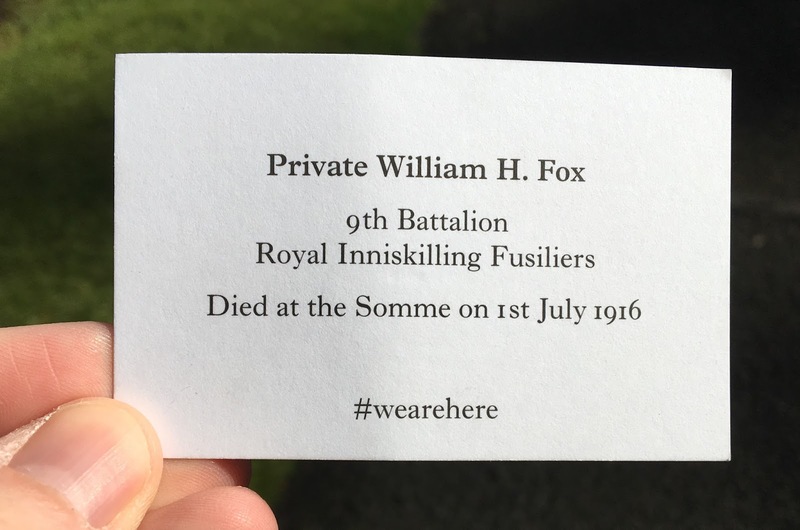 When approached by a member of the public, rather than speaking they simply reached into a pocket and handed over a white card bearing the name of a local soldier who died at the Somme on 1 July 1916. 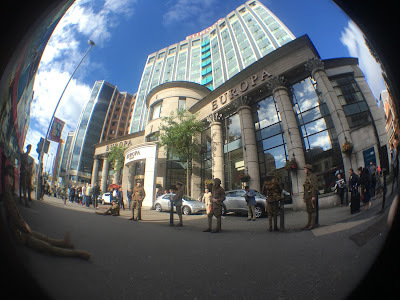 The squad moved throughout the city, appearing in Great Victoria Street bus station, outside the Europa, in Victoria Square, the MAC, the Big Fish and even caught the train to Ballymena. Another group were based in Derry. And across the UK, similar uniformed soldiers – ghosts of the war – appeared in railway stations and public places in a moving tribute to the losses at the Somme. The juxtaposition of khaki onto the modern colour palette was striking. The sound of boots marching in formation down the footpath. Last night, after the ghosts had disappeared from the street, the back story to the event was explained. 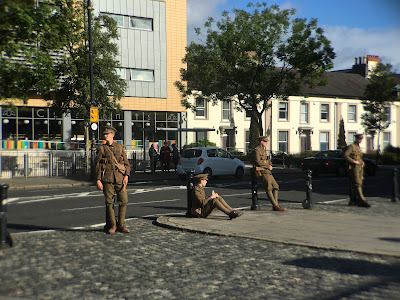 The local volunteers, organised by Lyric Theatre and The Playhouse were part of a UK-wide collaboration that saw 1400 men appear dressed in replica uniforms. The modern memorial to mark the centenary of the Battle of the Somme was commissioned by 14-18 NOW, the UK’s arts programme for the First World War centenary, and the work was conceived and created by Turner Prize-winning artist Jeremy Deller working with Rufus Norris, Director of the National Theatre. “The project breaks new ground in terms of its scale, breadth, reach and the number of partners and participants involved. This is the first time three national theatres have worked together on a joint project, and the first time so many theatres have worked together on a UK-wide participation project. 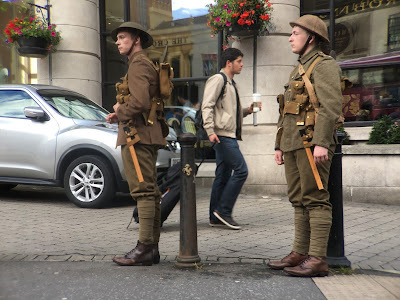 “The participants who walked the streets today were a reminder of the 19,240 men who were killed on 1 July 1916, the first day of the Battle of the Somme. Each participant represented an individual soldier who was killed that day. The work is partly inspired by tales of sightings during and after the First World War by people who believed they had seen a dead loved one. “The participants wore historically accurate uniforms, representing 15 of the regiments that suffered losses in the first day of the Battle. 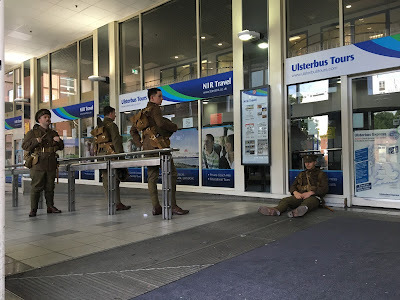 The soldiers did not speak, but at points throughout the day would sing the song ‘we’re here because we’re here’, which was sung in the trenches during the First World War. They handed out cards to members of the public with the name and regiment of the soldier they represented, and, where known, the age of the soldier when he died on 1 July 1916. For further events commemorating the battles of the Somme, check out History Hub Ulster’s Belfast Somme 100 programme, supported by Belfast City Council. It’s a sobering explanation from John Hull who had sight problems throughout his childhood and finally totally lost his vision as an adult in his 40s. A writer and university lecturer, he at first distracted himself finding ways to compensate for his failing sight and learning how to function as a blind academic by building up coping strategies and enlisting an army of readers to record text books onto tape cassettes. However, over time he realised that he had to chose whether to live in nostalgia to whether to fully embrace blindness. We see the real couple just once during the film. But throughout we hear their voices, with the soundtrack of Notes on Blindness piecing together John’s audio diaries made during the 1980s as he began to study his condition, and later conversations with his wife Marilyn recollecting on their experience of living with his blindness. Filmmakers Pete Middleton and James Spinney are imaginative in how they craft clips together, matching contemporaneous recordings of events with reflections years later. The sound track leads the visuals, with many of the shots are partially obscured, with the cast acting in shadows, seeing only part of their faces. Actors Dan Renton Skinner and Simone Kirby are seen lip syncing to some the recorded dialogue. While the technique is used sparingly, the audience sometimes experience blindness not only with darkness but also with bright whiteouts – eg, snow blizzards – that make it impossible to determine form or location. The film proceeds at a gentle pace, feeling its way through John’s evolving exploration of his new vision. Fond family memories are blighted by depression at not being able to see his children unwrap their Christmas presents. A dream of being able one of his daughters for the first time turns out to be more of a nightmare. We hear how John hesitated at the opportunity to visit his parents back in Australia, a place which no longer has any remaining visual memory and familiarity for him. There are some very tender, vulnerable moments. [It may be some sort of QFT record that tears didn’t come to my eyes until the 64th minute.] Yet we learn little about John’s views on any subject other than blindness. Even hearing him lecture, it’s not obvious that he’s a theologian. The one spiritual experience towards the close of the film puts his “gift” into a new perspective. 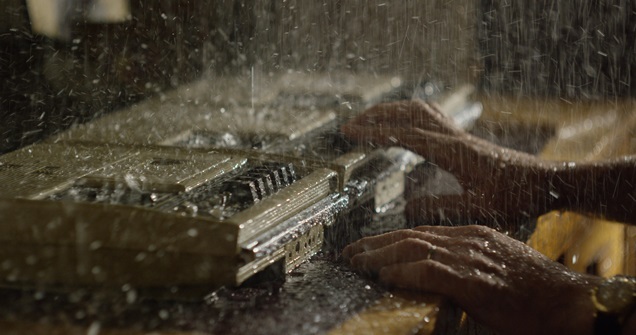 Notes on Blindness is being screened at the Queen’s Film Theatre until Thursday 7 July.